Colorful today introduced the uniquely designed C.J1900A-BTC PLUS V20 motherboard for mining rigs. 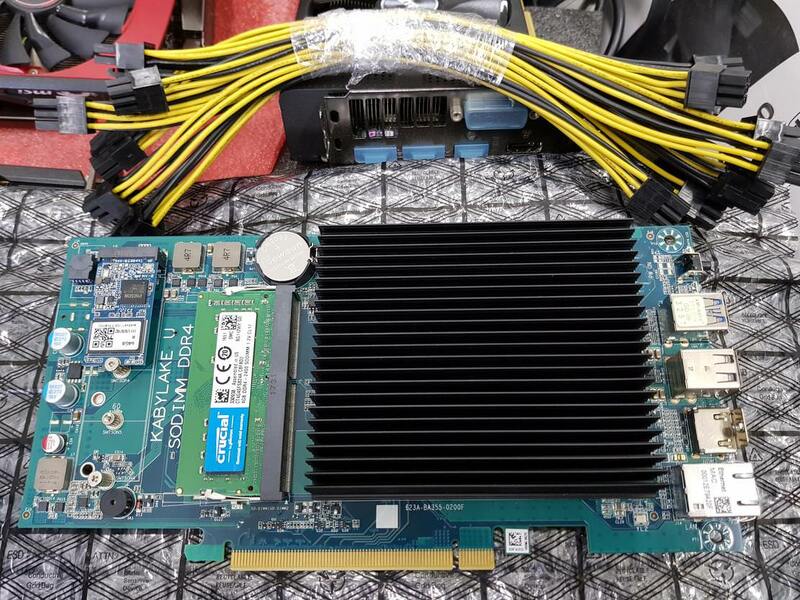 This odd-ball form-factor board is designed for makeshift racks, and removes the need for PCIe riser cables. 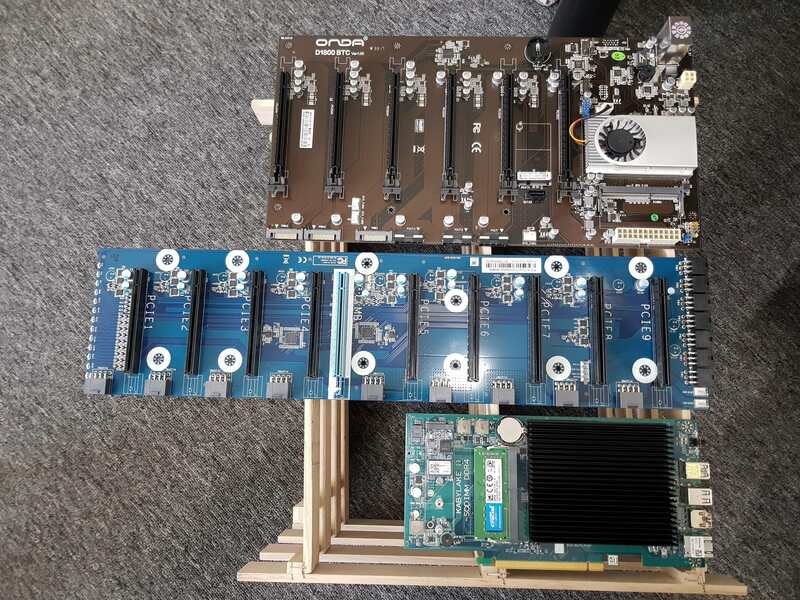 The board itself is a large PCB with nine PCI-Express x16 slots with 1-slot spacing, of which eight can be used for installing your mining graphics cards (x1 wiring), while the slot on the middle (blue), isn't really a PCI-Express slot. 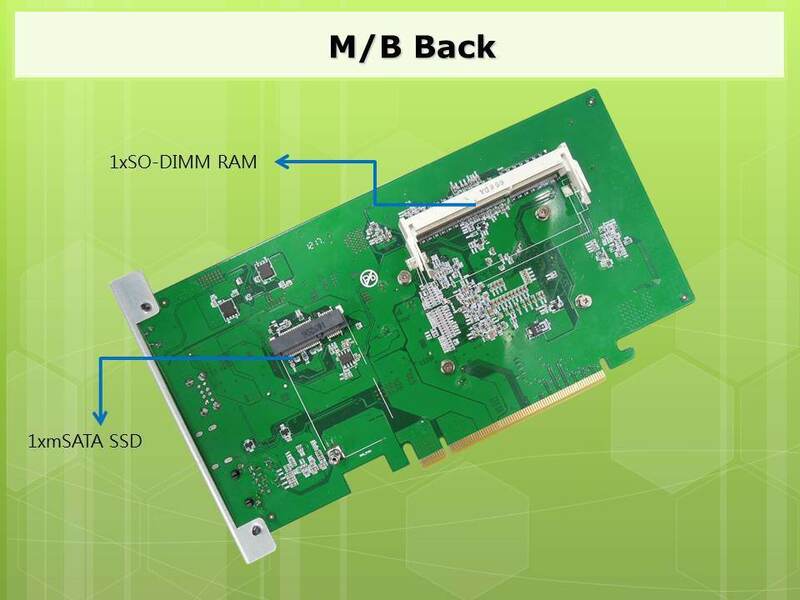 The blue slot has custom wiring for the business end of the motherboard, a riser card which houses the Celeron J1900 SoC, a DDR4 SO-DIMM slot, an mSATA 6 Gb/s slot for your SSD, and the board's main connectivity, which includes two USB 2.0 ports, two gigabit Ethernet interfaces, and an HDMI display output. If you have trouble finding an mSATA SSD in 2017, there's also a standard SATA 6 Gb/s port. The riser draws power from a 4-pin ATX input. The main PCB has eight 6-pin PCIe power inputs, which wire out to 6-pin PCIe outputs near each black slot. 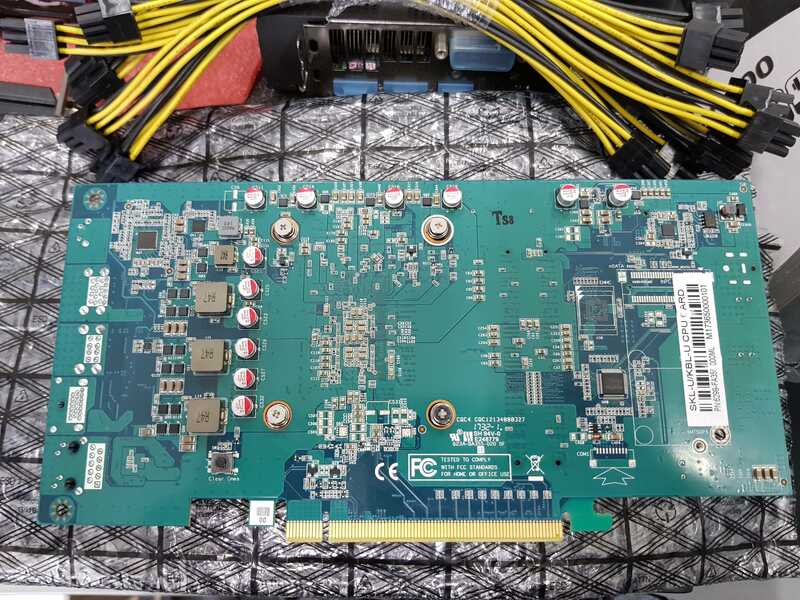 This is more of a cable-management feature, smaller (20 cm long) male-to-male 6-pin PCIe cables connect the outputs to the graphics cards. FAQ1: Can it run Crysis? Can it really? That'd be funny as hell! Actually, I don't think the Celeron J1900 would be the limiting factor as compared to CPU's of the time. Crysis is playable on a single core Athlon64 or Pentium4 as long as a good GPU is used[at modest settings]. What I question is the 1x PCIe lanes. Those are great for cryptocoin mining, but for graphics rendering it seems like it would be a serious bottleneck. Wouldn't you agree? I saw these on Alibaba and was actually talking to manufacturers to figure out if I could buy some! I'd love it for playing around with clustering while having it in a rack with a good board (the mining boards out there are amazing as well). I don't even care about mining. The form factors and unique stuff coming out of China is the interesting part. Lots of cool stuff that could be used in a homelab. The issue was the size wasn't standard, so the back of the PCBs overhung much further than standard cards. So it wouldn't fit. It's so cool to see so many variations though. I like the Colorful one more because it has two NICs. But I've seen one with a higher end Kaby Lake-U chip instead of Broadwell. 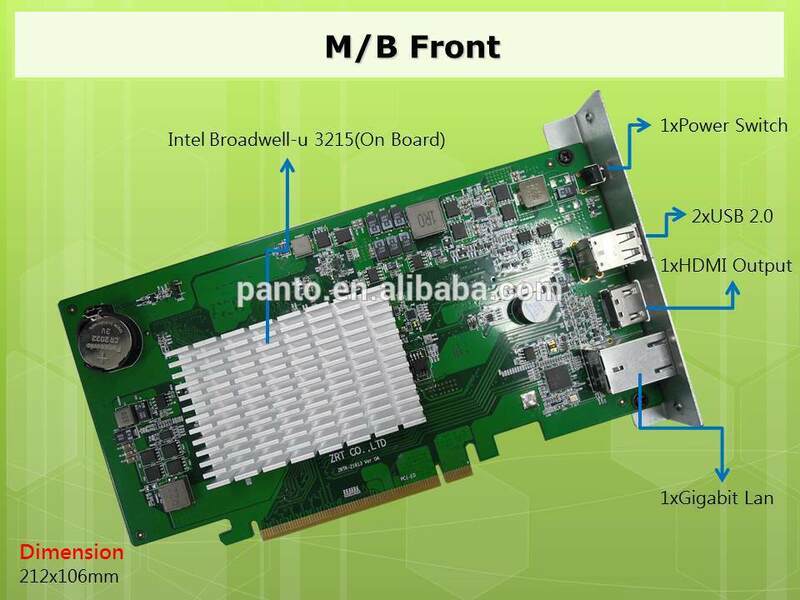 I'm wandering what chipset are they using to split PCIe? If my memory serves me right, J1900 and that whole series is limited to x4 PCIe 2.0 lanes total. I would love to test this out. I dont think it would lower the power usage much but the cost could be lower. Athlon 3000+ @ 2.4Ghz and x1950pro here, 1280x1024 High settings. Crysis scaled very well over a wide range of settings and hardware. To Colorful: You are so close to a sub ITX motherboard! Male one with a few ethernet ports and some USB and SATA and an M2 and we'll all be happy. Considering that it's a 10W platform, the amount can be significant (near 50W difference from the wall, comparing to dual-core Haswell or Skylake). I've seen lots of local miners also using embedded Carrizo boards or cheap AM1 rigs w/ passive cooling. Overall it translates to 400-500kWh/year, which isn't much, but still saves almost $50 on operational expenses in my country, and definitely much more in EU or US. It supports both DDR3 and DDR3L. It's not bad by any means. Actually, quad-core BayTrail is slightly faster than Braswell (2015-2016) in most tasks, while only has a slightly higher TDP and lacks certain multimedia features (HEVC acceleration, 4K60Hz support etc.). I'm currently building a mITX rig for my office based on Pentium J2900, cause my electricity is almost twice as expensive, as in my house. P.S. It is also worth noting that both NICs are Realtek RTL8111E. Just correcting the OP as it says ddr4 in the first post... and single slot spacing...its double. All of my mining machines run on g3900 or g3930 celeron processors that most of the time run at near 6% max. They are there to run the clocks and make sure the date is correct.